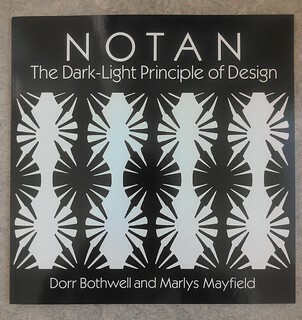 This week I'd like to share my favorite design book, Notan: The Dark-Light Principle of Design. The Amazon link lets you "look inside" the book, which I highly recommend. The book discusses principles that easily apply to modern quilting - the relationship between negative and positive space, symmetry, movement and tension. The exercises and examples in the book helped me look at negative space and quilt backgrounds differently - they can (and should be) interesting. The book has many examples on symmetry and tips to achieve the asymmetrical balance that is present in many modern quilts. when laying out a quilt, pay attention to where your eye is drawn. It shouldn't be so busy that your eyes never rest, but you shouldn't immediately be drawn to one element of the quilt.